Children are a gift from God and we received that gift for a brief moment in time. Faith Patrick was born at 19 ½ weeks. Something had happened to the amniotic fluid and it was leaking. She could not develop lungs properly and infection had started with in Jaime. Any life or death decisions were taken away, from Bill & Jaime, thank God. Jaime’s body started labor on its own and dilation occurred. And we can say that God is good. She was born all at once, our Faith, all whole and sweet and beautiful. With ten tiny fingers and toes, she was delicate, like fine porcelain. She was fearfully and wonderfully made. And we saw her body and held her. But her soul had already been whisked away on the wings of her angel. Faith is believing in what you cannot see. We believe Faith is in heaven – whole and well and strong. She has her Daddy’s nose and curls. She has her Mommy’s big brown eyes, long legs and fingers. She even has her Auntie Jenna’s grecian toes. She is up there now, wearing a pink tutu, toe shoes and soccer socks and she is twirling and dancing for Our Father the King. And He is smiling at her and she is laughing. She is waiting there for us and we shall see her in all her glory. Our Faith who we cannot see. . . But in the fullness of time we shall see. And so we wait for that glorious day. Time will heal our broken hearts. But a break always leaves a scar. 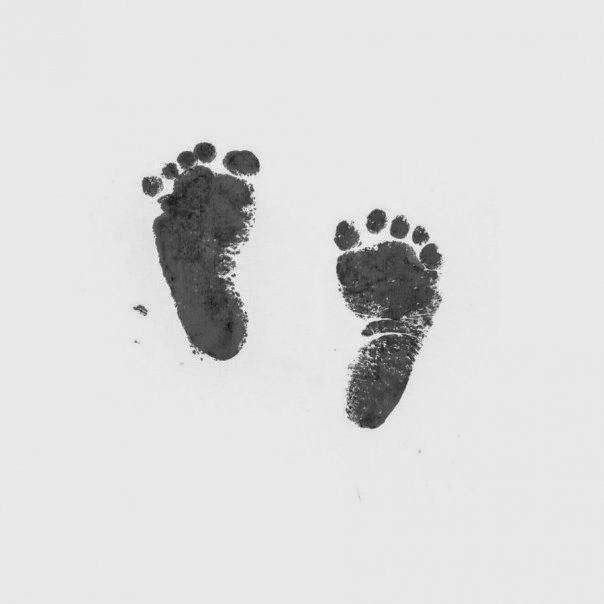 Our scar is the tiny footprint of our Faith and she will be in our hearts forever. Faith's footprints I really wanted to share them with you, because while she was tiny, she was real, and whole, and beautiful. I think of Faith whenever I see a white butterfly. I don't know why. 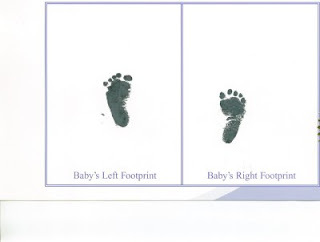 I have never seen footprints so small in my entire life nor otherwise would have if you had never posted this picture. Thank you for putting it on here. I'm humbled by God's greatness, goodness, and attention to detail. There is now no doubt in my mind whatsoever that life truly starts at conception. Her life was short, but it was God's design, and it was beautiful.